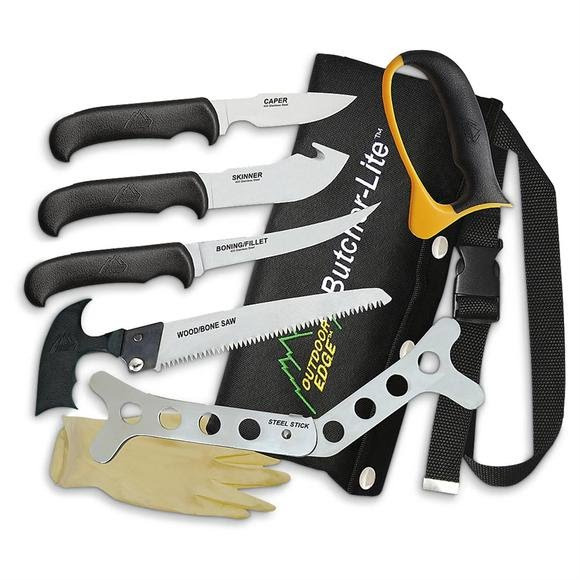 The Outdoor Edge's ButcherLite includes every tool to field dress, skin, quarter and debone big game in a nylon roll pack that converts to a belt scabbard for easy access to each tool. Includes 3” caping knife, 4 1/4” gut hook skinner, 6” boning/fillet, wood/bone saw, Tungsten Carbide sharpener, ribcage spreader and a set of game cleaning gloves. The Outdoor Edge&apos;s ButcherLite includes every tool to field dress, skin, quarter and debone big game in a nylon roll pack that converts to a belt scabbard for easy access to each tool. Includes 3” caping knife, 4 1/4” gut hook skinner, 6” boning/fillet, wood/bone saw, Tungsten Carbide sharpener, ribcage spreader and a set of game cleaning gloves. Each knife incorporates full-tang construction for superior strength and is taper ground to a razor&apos;s edge from high carbon 420 stainless steel. Ergonomic Kraton handles are designed for comfort during long use and the rubberized grips enable a secure lock-on grip even when wet. The nylon roll pack features snap-in plastic knife scabbards for easy removal and cleaning.